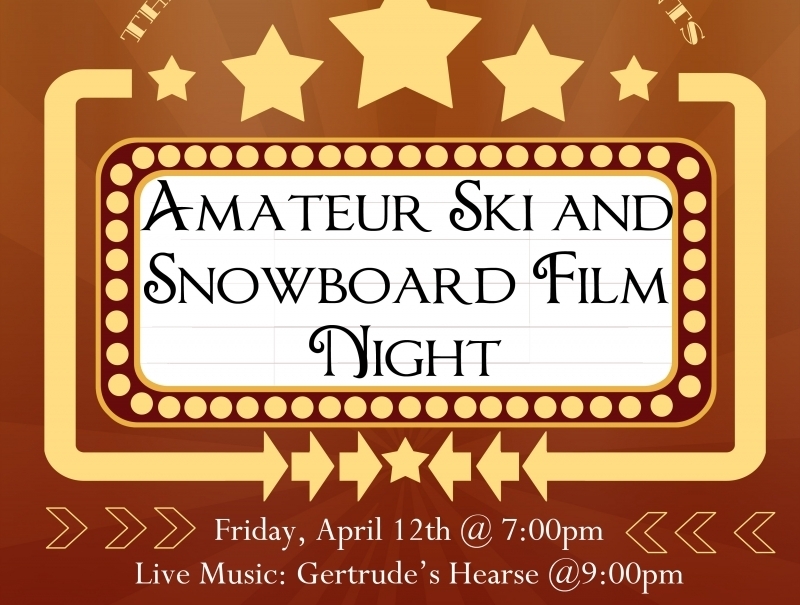 Get pumped for the ANNUAL AMATEUR SKI & SNOWBOARD FILM NIGHT! Submit your videos for the chance to win awesome prizes and see some of your friend’s biggest highlights (and lowlights) of the season! The event starts at 7pm on Friday April 12th, with live music to follow by Gertrude’s Hearse! If you’re not planning on submitting a film, come support your friends! Winners are based on AUDIENCE VOTES! OR submit it in person to a Snorting Elk Bartender or Crystal Mountain Hotels Front Desk on a CD or flash drive. Submissions can be turned in until 6pm on April 11th! One submission per person, LIMITED SPACE AVAILABLE! Videos must be 3 minutes or shorter. No professional cameraman, producer or editor may be involved in the overall production. Please include your name, phone number, address, email and brief overview with all entries. Make sure you’re present if you want to win some of our sweet prizes!!! For questions or if you are interested in sponsoring the event: call us at 360.663.2262, or email us at reservations@crystalhotels.com.